Shapes such as circles can be featured on your pages in an implied manner. 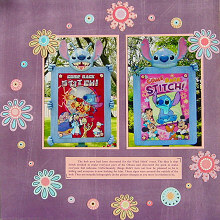 For example, this layout features a large circle to frame and highlight the photos. And yet I didn't have to cut any circular shapes. Instead, I implied the shape by arranging a collection of stickers in a circular pattern. It's a very effective way of subtley focusing attention on your photos while still being able to use plenty of embellishments. This layout was created using Daisy D's Scratched Purple Paper, pink cardstock, purple pen and Stickopotamus Daisies Vellum stickers. Mat both of your photos with pink cardstock. Adhere the first one to your page so that it is approximately 2.3cm from the right edge and 5cm from the top. Adhere the second photo approximately 1cm to the left of it, making sure both photos are inline with each other. Print or write your journaling on a piece of pink cardstock measuring approximately 16cm by 3cm. Adhere about 1cm below your photos, as shown in the layout above. Arrange your Stickopotamus Daisies Vellum stickers in a circular shape, as shown in the layout above. When you are happy with their placement, adhere. You may like to adhere them to white cardstock and cut them out first. This will make them stand out from the page more. If you wish, you can further enhance your circle by adding brads and doodles in amongst your stickers.